Mark Mazzetti (born May 13, 1974) is a two-time Pulitzer Prize-winning American journalist for the New York Times. He currently serves as a Washington Investigative Correspondent for the Times. Mazzetti was born in Washington, D.C. He attended Regis High School in New York City. He graduated from Duke University with a bachelor's degree in Public Policy and History. Later, he earned a master's degree in history from Oxford University. Mazzetti is a two-time winner of The Pulitzer Prize. In 2009, he was part of a team of reporters to win the International Reporting prize for coverage of the rising violence in Afghanistan and Pakistan and Washington's response. In 2018, he shared the prize for National Reporting for groundbreaking coverage of the connections between Donald Trump's advisers and Russia and the widening investigation into Russia's sabotage of the 2016 presidential election. In 2008, he was a Pulitzer finalist for reporting on the C.I.A's detention and interrogation program. 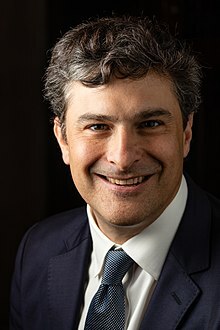 In 1998, shortly after receiving a master's degree from Oxford University, Mazzetti began reporting on national politics as a correspondent for The Economist. After leaving The Economist in 2001, Mazzetti joined the staff of US News & World Report and began reporting on defense and national security as its Pentagon correspondent. In 2004 Mazzetti joined the staff of the Los Angeles Times, and continued working with the Pentagon as a military affairs correspondent. His book, "The Way of the Knife: The C.I.A., a Secret Army, and a War at the Ends of the Earth," was published in 2013. It was a New York Times bestseller and has been translated into more than 10 languages. The book is an account of the secret wars waged by the C.I.A and Pentagon in the years after the Sept. 11 attacks. In 2003 Mazzetti spent two months reporting in Baghdad while traveling with the 1st Marine Expeditionary Force. In late 2007, he broke the story of the CIA's destruction of interrogation video tapes depicting torture of Al Qaeda detainees. The story launched a Justice Department investigation into the episode, and he won the Livingston Prize for National Reporting for his work on this story. The story about the tapes destruction also led to an investigation into the C.I.A. 's detention and interrogation program by the Senate Intelligence Committee. The committee's final report, released in December 2014, found widespread abuses in the program and regular use of torture. In addition to sharing the Pulitzer Prize for International Reporting in 2009, he won the George Polk award with colleague Dexter Filkins for coverage of the secret wars being waged in Pakistan and Afghanistan. The Puntland Government (Somalia) criticized a piece by Mazzetti and Eric Schmitt that portrayed the Puntland Maritime Police Force (PMPF) as a “private army” that was “abandoned” by its major donors. The article exposed how mercenaries hired by Erik Prince, the former head of Blackwater, training Somalis to combat piracy by the abandoned the program. Puntland officials clarified that the PMPF still is "part and parcel of Puntland Government’s security forces" and that they still receive the financial support from their backers. They also criticized the authors for not acknowledging any of the PMPF's success and for neglecting to contact any Puntland Government officials to comment on the story. In 2011, he furnished the pre-publication text of an opinion column written by Maureen Dowd concerning the making of the movie "Zero Dark Thirty" to CIA spokesperson Marie Harf for review. Dowd had reportedly asked Mazzetti to fact-check a detail in the column for her. Times managing editor Dean Baquet dismissed the incident as "much ado about nothing," but the Times' public editor expressed strong disapproval of Mazzetti's actions. In 2016, he was part of a team of reporters who won the George Polk Award for an investigation into operations by Navy SEALs and for a lengthy examination of the operations of SEAL Team 6. In December 2016, Mazzetti was named Washington Investigations editor, leading a team of reporters to look into all parts of the government and Washington. On May 30, 2010, Mazzetti and Lindsay Friedman were married in Alexandria, Virginia. In 2018, Mazzetti shared a Pulitzer Prize for reporting on Donald Trump's advisers and their connections to Russia. ^ Charlie Rose (May 29, 2009). "Season 69, Episode 05.29.09 -- Charlie Rose - Jane Perlez / Eric Schmitt / Mark Mazzetti / Pir Zubair Shah / Jake Tapper Airdate: 29-May-2009". Charlie Rose LLC. Archived from the original on March 26, 2010. Retrieved February 19, 2010. ^ a b "Mark Mazzetti Bio and Index". The New York Times. ^ a b "Mark Mazzetti Biography". Online Biography. Washington Week. Retrieved November 13, 2011. ^ "C.I.A. Destroyed 2 Tapes Showing Interrogations". The New York Times. December 7, 2007. ^ Sanger and Mazzetti. "Israel Struck Syrian Nuclear Project, Analysts Say". The New York Times. Retrieved March 12, 2012. ^ Palermo, Joseph. "Memo to David Sanger and Mark Mazzetti of The New York Times". The Huffington Post. Retrieved March 12, 2012. ^ Beyerstein, Lindsay. "Winners & Sinners: from Mary Murphy to Mark Mazzetti". The Sidney Hillman Foundation. Archived from the original on February 2, 2012. Retrieved March 12, 2012. ^ "Private Army Formed to Fight Somali Pirates Leaves Troubled Legacy". The New York Times. October 4, 2012. ^ "Somalia: Puntland Anti-Piracy Force Making Progress". Garowe Online. October 8, 2012. Archived from the original on November 23, 2012. ^ Greenwald, Glenn (August 29, 2012). "Correspondence and collusion between the New York Times and the CIA". The Guardian. Retrieved February 17, 2013. ^ "Mark Mazzetti Is Named Washington Investigations Editor at The New York Times". Retrieved July 12, 2017. ^ "New Washington Investigations Team". ^ "Lindsay Friedman, Mark Mazzetti". online article. the New York Times. Retrieved November 13, 2011. ^ "Journalism Award Prizes". geraldrfordfoundation.org. Gerald R. Ford Foundation. Retrieved August 23, 2016.